Ball lightning is described as a luminous sphere of lightning which seems to appear out of nowhere and vanishes into thin air. It varies in size from 2 to 10 inches in diameter. They are reportedly seen around a thunderstorm and usually hover parallel to the earth. Balls that appear distinctly orange and blue seem to last longer than average. Underwater lakes, or brine pools, are areas of water with an extremely high concentration of salt. The concentrations of salt are so high that the mixture is heavier than water and so lies underneath the normal sea water. The high salinity of these pools prevents water of lower salinity from entering and creates a distinct surface and shoreline for the pool. The surface of these pools behaves quite similarly to the surface of a regular pool, with waves and everything. In July of 2010 floods swamped parts of Pakistan. An unexpected side-effect of the massive flooding was that millions of spiders turned trees into cocoons. They crawled into trees to escape the rising flood waters. Because of the scale of the flooding and the fact that the water took long to recede, many trees became cocooned in spiders’ webs. Locals had never before seen such a phenomenon before, but they also reported an unexpected decline in the mosquito population. The bioluminescence in the waves is the product of a bioluminescent phytoplankton. Various species of phytoplankton are known to produce bioluminescence, and they are found in oceans all around the world. These microorganisms emit light in response to stress, such as when a wave crashes into the shore, a surfboard slashes through the surf, or a kayaker’s paddle splashes the water. 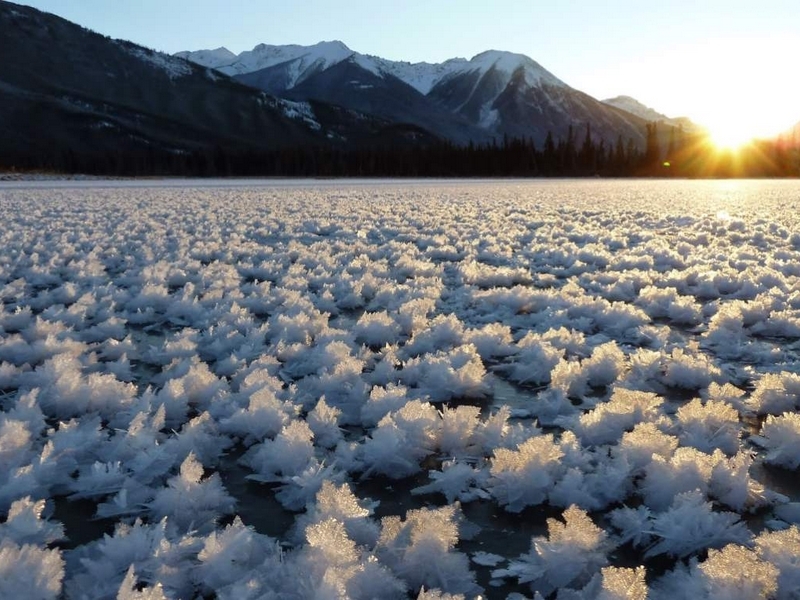 Frozen bubbles lie beneath the Lake Abraham in, Alberta, Canada. Normally the bubbles would break to the surface but in low temperatures, they freeze. Methane gas, which is emitted by bacteria after they consume dead organic matter, is fairly harmless but the bubbles can explode if lit. The Dallol volcano in Ethiopia’s Danakil Depression spews what looks like blue lava. The amazing electric blue glow is produced by the bright blue flames of burning sulfuric gases rather than lava. The heat of magma sometimes ignites the sulfur dust in the soil. The depression is geologically active, with hydrothermal vents and sulfur springs, some of which are tourist attractions. In the hot, expansive Karakum desert in Turkmenistan, near the 350-person village of Darvaza, is a hole 230 feet wide that has been on fire for over 40 years. Locals know the crater as “The Gates of Hell.” Its glow can be seen for miles around. The hole was created in 1971 when a Soviet drilling rig accidentally punched into a massive underground natural gas cavern, causing the ground to collapse and the entire drilling rig to fall in. Having punctured a pocket of gas, poisonous fumes began leaking at an alarming rate. To head off a potential environmental catastrophe, the Soviets set the hole alight. The crater hasn’t stopped burning since. The Namibian Fairy Circles are mysterious, circular, bare spots of desert dirt among otherwise continuous grass carpet found on the grasslands of Namibia in Africa. The circles, which range from about 6 to 30 feet in diameter, last 24-75 years, and what causes these is unknown. Delicate ice-crystal structures called frost flowers arise on the surface of newly formed sea ice under very cold conditions. Frost flowers growing on sea ice have extremely high salinities and concentrations of other sea water chemicals and, because of their high surface area, are efficient releasers of these chemicals into the atmosphere. Snow Chimneys or ice fumaroles are a phenomenon that are specific to volcanoes located in very cold areas, where gas and heat seeping through the volcano vent melt the snowpack above, carving out a cave. Steam coming out of volcanic vents in the ground freezes as it hits the cold air, creating chimneys of ice. These ice towers, formed around gasses that escape from vents in the surface, stand up to 60 feet high sometimes. These are mostly found in the volcanic areas of Arctic and Antarctic.